The DR-G1100 Series scanners are capable of handling a wide variety of document sizes, from business card up to 11 x 17 inches, and even up to 118.1 inches using Long Document Mode. Flexible paper feed and output guides further enhance the scanners’ ability to reliably feed all types of documents. The imageFORMULA DR-G1100 series production scanners have been developed to withstand the rigors of production-level scanning, the cornerstone and critical first step in any successful high-volume document management system. These scanners are capable of high-speed, accurate, and flexible imaging in order to convert and process vast amounts and wide ranges of documents. Though document scanning and processing are the foundation of effective document management systems, they can be time-, labor-, and cost-intensive. For companies to stay abreast of the business and economic challenges, they must focus on improving productivity, maintaining business continuity, and facilitating document integration. The Canon DR-G1100 scanners are equipped with a dedicated, onboard image processing chip, making them capable of maintaining high scanning speeds even with various image processing capabilities enabled. Centralized scanning solutions–operated by a limited number of dedicated and trained individuals–enable companies to spend less time processing, retrieving, and searching for paper documents, and can help facilitate collaboration throughout the organization. The DR-G1100 scanners feature an intuitive control panel that allows easy access to select scanner settings and programmable preregistered Scan-To-Job buttons. These scanners are also equipped with a motorized paper feed tray that can be adjusted to the height of the batch. All these features are designed to deliver unattended batch scanning for optimizing workflows and improving productivity. Nothing can be more devastating to a document management system than scanner failure. Equally frustrating and time-consuming are scanners that constantly have misfeeds and paper jams. Canon manufactures the DR-G1100 scanners under the stringent ISO 9001 Quality Management System standards to produce scanners that are capable of withstanding the rigors of production-volume scanning. 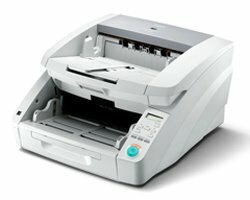 Canon’s advanced and unique feeding mechanism, Ultrasonic Double-Feed Detection, and Rapid Recovery features deliver ultra-reliable document scanning. A solid-body design, heavy-duty feed and eject trays, and staple detection capability are just some of the features that ensure minimal downtime and help to maintain business continuity. During document conversion, high image accuracy and quality are important to minimize error rates, achieve regulatory compliance, and increase the ease of document integration and retrieval. The DR-G1100 scanners capture fine print and other small details with exceptional clarity using Canon’s advanced CIS sensor technology with up to 600-dpi optical resolution. Consistent image quality is further guaranteed by the ability to enhance faint text, reduce moiré patterns, and remove unwanted backgrounds from images. In paper-intensive environments, the ability to deliver reliable, unattended batch scanning of varied documents greatly reduces labor-intensive pre-sorting and job preparation efforts, thereby facilitating document integration. ADF Width: 2.2" x 12"
ADF Length: 2.8" x 17"
factory warranty extension from Canon. A non-warranty PM usually costs $800!